I can only imagine what went through my father’s head when I said that to him on the last Sunday of July 1999. My best guess is a mixture of amusement and disbelief. After all, I was 10 years old and talking about entering one of the most difficult tests of endurance that an athlete can attempt: the Ironman Triathlon in Lake Placid, New York. This was the first race of its kind held on the United States mainland, away from the sport’s home in Kailua-Kona, Hawaii. In 1978 a group of athletes gathered together there to prove who was the “fittest”: swimmers, bikers, or runners. Few at that time could have known the success the sport would experience over the ensuing decades. The 2.4 mile swim, 112 mile bike ride, and 26.2 mile marathon run that the event requires in a period of 17 hours or less is daunting to some, impossible to many, and downright insane to most. Despite, or perhaps because of my young age at the time, I was already dreaming of crossing that finish line. 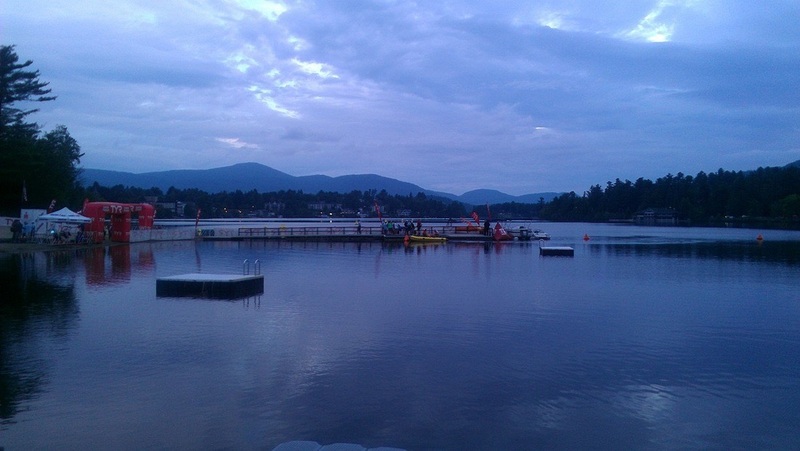 The starting line of the 2013 Ironman Triathlon in Lake Placid, NY. Taken by the author the morning of his first Ironman. 14 years later, I found myself standing alone on the grass next to Mirror Lake in Lake Placid. I was watching the sunrise and doing everything I could to keep my breakfast from reappearing. I was so nervous I couldn’t speak. At 6:30 that morning, a cannon blast would start the race I’d been dreaming of for all those years, and I was terrified I wouldn’t live to see the clock strike 7:00. Despite spending the last 9 months preparing for the event, I was convinced it was going to kill me. In many ways, crossing the finish line on the Olympic Oval that day was the single greatest feeling (and moment) of my life. Nothing I have ever done has left me feeling so simultaneously complete and empty. Understandably, the first question many people ask when they hear I’ve done something like Ironman is “Why?” Channeling my inner George Mallory, my stock response is usually “Because it is there.” My reasons for attempting the event are as complicated as they are numerous. I do it motivated by both vanity and self-doubt. Ironman, and triathlon in general, both confirm my belief in myself and challenge me to the absolute edge of my physical limits. 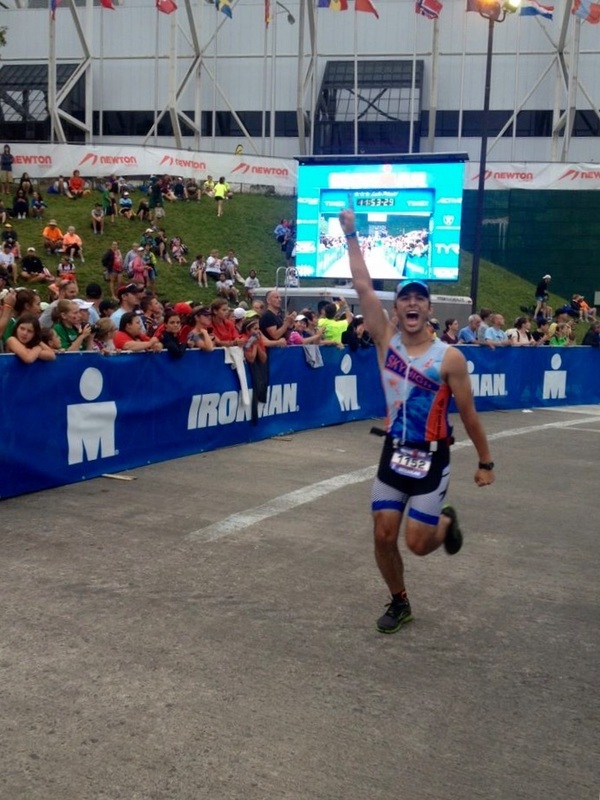 Completing an Ironman teaches you things about yourself that you can learn virtually nowhere else. While participating in my first, I learned the truth behind so many clichés that we are taught as children: “Impossible is nothing” and “You can do whatever you put your mind to” especially come to mind. For many people, the physical training over a period of months is the most difficult part of the sport. I am not talented enough to be a professional triathlete, and as such, must work a regular job like everybody else. As a teacher, there are times that fitting a workout into my day can seem impossible. I have graded, planned, and evaluated while riding my bike. I think about my students during swim workouts. Some of my best lessons have been created while running. I have been blessed with a work environment that is very supportive of my habits. Most weeks, my principal will stop by to check on how my training is going. The weeks he doesn’t, I think it’s obvious to those around me that it isn’t going well. Many of my coworkers are athletes, and they ask questions about training—whether out of interest or simply to humor me, I may never know, but at least their efforts are appreciated. Even without them there on race day, I know a number were thinking about me and watching online. That support is an incredible source of motivation. The author competing in the 2015 Ironman. Photo by B. King. This sport has also become one of the most significant sources of social interaction for me. Riding a bicycle for six hours is a lot more tolerable when you ride with friends, and thankfully I have a number of friends willing to torture themselves along with me. My former teammates (I was a NCAA Division II runner) have picked up the sport, and they were my first occasional training partners. Moving to the Boston area has allowed me to join a tri club, and in the few short months that I have known them, the club I joined has accepted me as if they had known me for years. Triathlon is one of the few sports I have participated in that has an important social component. Throughout the Ironman, talking to other competitors is often the only distraction from your body’s constant complaints. Other competitors have often checked up on how I’m feeling, asked what I need to feel better (and provided the necessary items at times), and taken the time to get to know me—aside from the aching <insert body part here>. The community of triathletes is an incredibly welcoming one, and that goes from the bottom of the sport all the way through its professional ranks. Ironman training has also become a source of solace and coping mechanism. Bad days at work, relationship trouble, family problems, roommate fights, and bad moods seem to melt away after running a few miles, sitting on my bike for a couple hours, or swimming incalculable laps. As I struggled to find a teaching job throughout my first years of training, every failed application and interview was met with a hard workout. This past summer, as my family dealt with the fallout from an event that brought unexpected and unwelcome media scrutiny, my training was the only thing that I knew I could turn to for comfort. Ironman has helped to provide me with some of my life’s greatest successes, while also being a vehicle to celebrate many of the rest. Equally as important to the process of becoming an Ironman is the mental preparation required. It is important to keep in mind that throughout the course of the day, there will be great stretches and terrible stretches—neither will last. More importantly, and simply put: It hurts. A lot. Throughout the course of a 12 (or more) hour race, there are several points at which the body wants to quit. The mental strength forged by miles of training serves me both in races and in everyday life. Similar to an Ironman, there are great stretches in life and there are not-so-great stretches. I think it’s important to keep in mind that these stretches too, don’t last forever. They are all a chance to learn more about oneself. It can be said that Ironman is a microcosm for life, as you will only get out of it what you put into it. Panorama of the 2014 Ironman. Photo by the author. Now that I have completed three different Ironman races at Lake Placid, I can recognize each year has been radically different. My training each year can be defined by one word, I think. Those words are: fear (2012-13), confidence (2013-14), and joy (2014-15). Prior to my first Ironman, I was absolutely terrified of the distances. I felt every time I skipped, cut short, or otherwise did not complete a workout, inevitably guaranteed failure. Added together, I felt (probably correctly) that all the missed workouts would result in my collapsing in a heap on the side of the road and dying alone, somewhere outside of Lake Placid. My second year, I was overconfident, under trained, and I paid for that dearly on race day. For the first time in my life, my mind and spirit were willing to continue pushing forward, while my body simply could not. I learned from these two years, and this past season became one marked by sheer joy. Most workouts were fun, and even those that weren’t were a chance to make friends. It is no coincidence that my best race yet was this July’s. The author crosses the finish at the 2013 Ironman - his first. Photo by S. Racette. For the fourth year in a row, on the last Sunday of July 2016, I will be standing on the shores of Mirror Lake, waiting for the sound of cannon fire. This year will be markedly different from the past three, however, as I will be waiting for that cannon with approximately 100 teammates. Together we will represent the Multiple Myeloma Research Foundation (MMRF) Team for Cures, an organization whose sole mission is to support the search for a cure for cancer. We will be raising money for research over the course of the next 9 months, and attempting to better the $900,000 raised by last year’s team. Over the past three years, I have raced to prove something to myself, and I have raced simply for the fun of it. This year, I will be racing with a purpose, for a cause much greater than myself. Ironman may not be for everyone. It puts significant strain on many other aspects of my life, and most years I find myself wishing I chose a more “normal” lifestyle. Every spring since I signed up for my first, I have told friends and family that, “I’m taking a break next year.” Yet, during that last week of July, I find myself further drawn to the race. Some might claim this makes me masochistic, but I always remind myself that running down the finish chute and hearing Mike Reilly, the “Voice of Ironman” shout “You are an Ironman!” makes every painful mile worth it. Header art by T. Guzzio. Original photo by L. Wolfe. DJ Racette is a Special Education teacher and lives in Medford, MA. 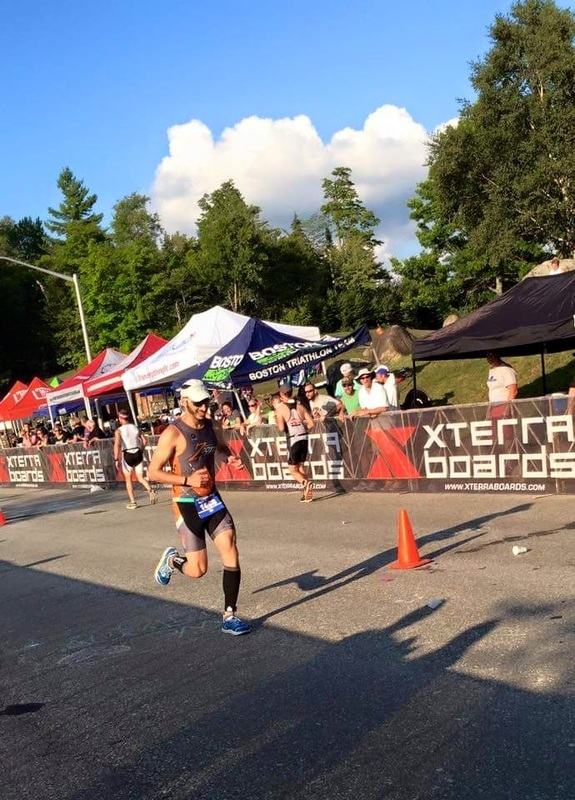 He picked up the sport of triathlon after running at both Saranac Lake (NY) High School, and The College of Saint Rose. He continues to work on trying to balance work, triathlon, and some semblance of a social life. You can connect with him on email at racettedj@gmail.com. You can also contribute to his fundraising efforts on behalf of the MMRF by clicking here.